Adm. Harry B. Harris Jr.’s promotion to commander of the U.S. Pacific Fleet is being hailed as a milestone for Japanese Americans. 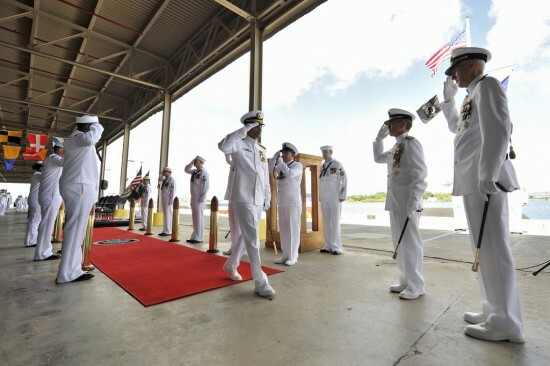 The change-of-command ceremony, in which Harris relieved Adm. Cecil D. Haney, was held Oct. 16 on Joint Base Pearl Harbor-Hickam, with the USS Arizona and Battleship Missouri memorials as a backdrop. 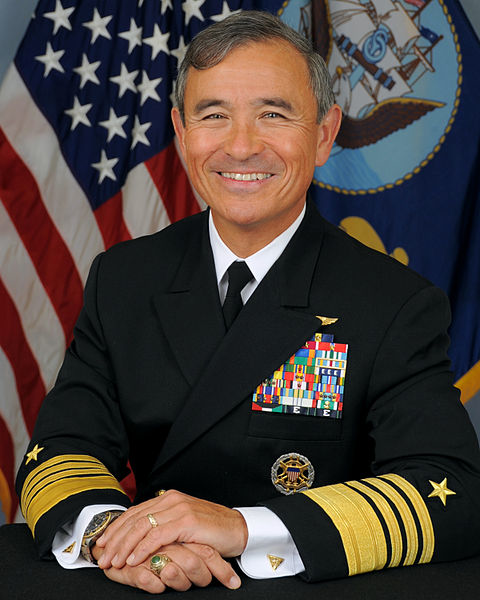 Harris was born in Yokosuka, Kanagawa Prefecture in 1956, the son of a U.S. Navy chief petty officer and his wife from Kobe. The family relocated to the U.S. and he grew up in Tennessee and Florida. According to the Japanese American Veterans Association, Harris said the 1951 movie “Go For Broke” made him proud of his Japanese heritage, and the courage and patriotism of Japanese Americans who served in the 100th Battalion, 442nd Regimental Combat Team and the Military Intelligence Service during World War II have inspired him in his professional career. As the keynote speaker last year at Go For Broke National Education Center’s “Evening of Aloha,” Harris talked about his upbringing and the values he learned from his mother, such as giri (duty or obligation). Among those attending the ceremony was Floyd Mori, president/CEO of the Asian Pacific American Institute for Congressional Studies and former national president of the Japanese American Citizens League. Adm. Samuel Locklear III, commander of U.S. Pacific Command (PACOM), commended Haney on his leadership during challenging times. “Your strategic vision has set the stage for a new level of engagement, dialogue and consistence inside the PACOM area of responsibility,” said Locklear. Harris is the 34th naval officer to command the Pacific Fleet since it was established in February 1941 with headquarters at Pearl Harbor. He graduated from the Naval Academy in 1978, is a MIT Seminar 21 fellow, and has attended Harvard’s Kennedy School of Government, Georgetown’s School of Foreign Service, and Oxford University for East Asia security. As commander of Pacific Fleet, Harris is responsible for 100 million square miles “from Hollywood to Bollywood, from Antarctica to the Arctic Circle.” Covering more than half the Earth’s surface, the Indo-Asia-Pacific region is vital to U.S. economic and security interests. The Pacific Fleet maintains combat-ready and forward-deployed naval forces that consist of approximately 200 ships/submarines, 1,100 aircraft and 140,000 sailors and civilians. “Whether called to fight and win or to protect the peace, Pacific Fleet operates alongside allies, partners and multilateral organizations to ensure a stable and secure Indo-Asia-Pacific where all nations can prosper,” the Navy said in a statement.